Alumni student Kelly was attracted to East Surrey College as "it is a new building with updated equipment and fantastic facilities, and offered more practical courses." She enrolled on the Theatrical, Media and Special Effects Make-Up course, having had a desire to be a prosthetic make-up artist since the age of 14. "I enjoyed bringing a look together. The character development, the trials, the tiny details and completing the look with costume, wig and makeup. The build-up to photoshoot day was always exciting to me, as I got to be as creative as possible and see my vision come to life." Amongst the skills learnt on the course, Kelly commented that she furthered her ability to "fix problems, organise time and be critical of my work to improve and manage my business." Projects with real clients also helped her prepare for work "as I no longer get stressed in situations and I manage my time much better. It has made me a far more confident and independent individual." Since graduating in 2018, Kelly balances her time between working as a Brand Ambassador for Bare Minerals and as a freelance Make-Up Artist and Hair Stylist. Her freelance work has led her to work with celebrities including Sinitta, Talulah Eve Brown and Dr. Vincent Wong, and her favourite job of the year was working on Young Frankenstein the Musical! With a passion for hair styling and wigs, Kelly is hoping to work full-time in the West End, and continuing to put into practice the techniques learnt on the course. "Do your course work as soon as you get it! Work can pile on fast and deadlines come around faster than you think. Secondly, grow your contacts, network and advertise yourself, this will help you in the long run. Thirdly, practice makes perfect. It is frustrating when things to not go to plan, but eventually with dedication, research and will power you will find a way over that obstacle. Last but not least have fun with the course! Be as creative as possible and build up your portfolio." 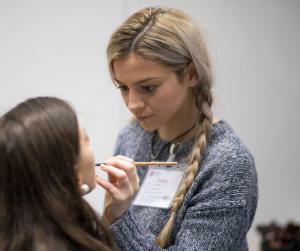 Discover our university level courses, including the Theatrical, Media and Special Effects Make-Up HND.